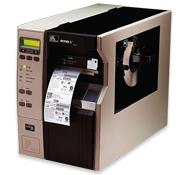 Built on the solid, tested XiIIIPlus platform, the R110Xi—for four-inch labels– offers an unprecedented level of on-demand printing flexibility in tag placement as well as unique features such as XML for seamless integration into enterprise systems, automatic calibration, flexible inlay positioning, multiple power levels, statistics tracking, easier RFID programming and more detailed information through the front panel display. The R110Xi features the ThingMagic RFID reader module which offers the flexibility needed to guarantee a simple, cost-free upgrade path to emerging RFID protocols. The R110Xi supports currently available protocols, including EPC Gen 1 Class 1, EPC Gen 1 Class 0, EPC Gen 2 Class 1, Matrics 0+, ISO18000-06, and Philips UCODE 1.19. Because the printer/encoder is firmware upgradeable to support new protocols, users are assured that they can seamlessly upgrade to future RFID protocols as needed.